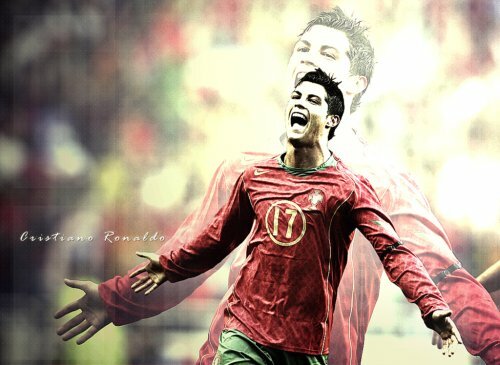 Cristiano Ronaldo Facts start with birth place on February 5, 1985 in Santo António, Portugal. Current teams: Real Madrid C.F. (#7 / Forward), Portugal National Football Team (Forward). Cristiano Ronaldo facts start with the fact that he is regarded as one of the best soccer players in the world, for his generation. Ronaldo's full name is Cristiano Ronaldo dos Santos Aveiro. Ronaldo's name was inspired by his father's favorite actor and USA President Ronald Reagan. Cristiano's father, Jose Dinis Aveiro died from alcoholism at the age of 52. Ronaldo has sworn off alcohol as a result, however he has been spotted by the press drinking gin and juice on occasion, making this an interesting fact about Cristiano Ronaldo. Cristiano Ronaldo is known to be super fashionable. Passion for fashion, and the millions of dollars he made from soccer, allowed him to open his own fashion boutique called CR7 in Portugal. His two sisters run the business. Ronaldo models for some major brands, including Armani Exchange and Nike, which reportedly bring Ronaldo an extra $25 million. Interesting fact about Ronaldo's early career follows the worlds sexiest man David Beckham leaving Manchester United, and Ronaldo taking his number 7 jersey. Ronaldo brought more fame to Manchester United's famous #7 jersey, winning FIFA's World Best Player award. Cristiano Ronaldo facts continue with a wax replica made of him 2 days before the 2010 World Cup. The wax statue can be seen at the famed Madame Toussaud's, in London. Ronaldo has often been quoted saying "I know I am the best", and that is Ronaldo soccer fact coming from himself. Cristiano is a known player on and off the soccer field. He often changes girlfriends like his soccer socks. Interesting soccer fact about Ronaldo and his childhood, is that Ronaldo was nicknamed "cry-baby" as a child. He cried when he passed the ball and his friends didn't score. People also called him "little bee" because nobody could catch him. Ronaldo soccer fact is that he was an amazing player even at 11 years old. Paulo Cardoso, his first coach at Sporting Lisbon, said: "When he got the ball, he went past two or three players. At the end of the game the players gathered around him, they knew he was a special kid." Fun facts about Cristiano Ronaldo continue with his teenage years when he spent hours training at the local gym. His style of training was putting weights on either foot, and dribbling with the ball. He thought it would improve his technique, because without weights he would be even faster. Interesting fact about Cristiano Ronaldo is that Liverpool was the first choice for Ronaldo, but they thought that he wasn't good enough for the price tag he had. This happened only one year before he signed for Liverpool rivals Manchester United. Manchester United paid £12.2 million to bring Ronaldo from Sporting Lisbon, in 2003. After the winger played against Manchester United in a friendly match, Sir Alex Ferguson said: "At half-time I knew I had to sign this boy. He was sensational." Cristiano Ronaldo soccer facts at Manchester United show that Sir Alex Ferguson had no hesitation in handing Ronaldo the prized number 7 shirt when he came to United. Sir Alex Ferguson said at the time: "We've had some fantastic No 7s; Bryan Robson, Eric Cantona, George Best and David Beckham. Some players wouldn't want that jersey because of high expectations it comes with, but his confidence was high even at 18. When he made his debut as substitute against Bolton he took the place by storm." Ronaldo scored his first goal for Manchester United on November 1st, 2003 against Portsmouth from a free kick. Read more facts about Cristiano Ronaldo by visiting 50 interesting facts about Cristiano Ronaldo.